Home / "Bread, Roses & Dignity Too"
James is a practical theologian. In today’s lesson he confronts self-indulgent religion—a faith that enjoys hearing the word of God, but fails to put it into practice. For James, in order for the Good News to be understood, it must go from being heard, to being translated into concrete acts of love. This is what he means when he says: “But be doers of the word, and not merely hearers who deceive themselves.” For James, hearing and doing are flip sides of the same coin—they cannot be separated one from another. For James, putting love into action is closely linked to the worship of God (verse 27) “Religion that is pure and undefiled before God, is this: to care for orphans and widows in their distress, and to keep oneself unstained by the world.” So, solidarity with the poor, and those who struggle, is not only an ethical requirement, it is also a way to encounter Jesus, who identified himself with those who suffer: “For I was hungry and you gave me food, I was thirsty and you gave me something to drink, I was a stranger and you welcomed me, I was naked and you gave me clothing, I was sick and you took care of me, I was in prison and you visited me.” (Matthew 25:35) God, it seems, has a heart for the underdog. This is important to bear in mind, as we consider the following scenario—which played out during the bitterly cold winter of 1912 here in Massachusetts in the city of Lawrence in the cotton weaving room of the Everett Mill when the power looms that thundered, suddenly fell silent. Weavers, that afternoon, opened their pay envelopes to discover their weekly wages had been reduced by 32 cents. The reason: A newly enacted Massachusetts law had reduced the workweek of women and children from 56 to 54 hours. Mill owners retaliated by cutting the workers wage proportionally. But, for many of these workers, that 32 cents was precious, making the difference between eating a meal or going hungry. That’s how low wages were, and how precarious life was for the working poor. At the time, Lawrence was known as “Immigrant City.” Workers in the mill were mostly immigrants from twenty different countries. Although strikers lacked common cultures and languages, they became united in a common cause. By the next day, more than 10,000 workers were out on strike. Women didn’t shy away from the protests. They delivered speeches and marched in picket lines and parades. The banners they carried demanded living wages and something else….dignity. Printed upon the banners were words from a popular poem: “We want bread, and roses, too” giving the work stoppage its name, the Bread and Roses Strike. Mill owners retaliated, and violence ensued. 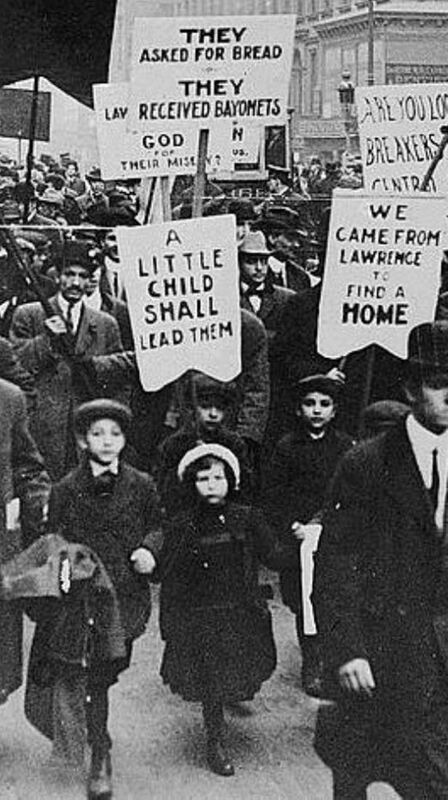 Striking families became fearful and sent over one hundred of their children out of harm’s way to New York City to live with relatives, or, in some cases, complete strangers, who had agreed to provide food and shelter. A cheering crowd of 5,000 greeted the children at Grand Central terminal. More children followed, and on February 24th, as another 46 children were brought to the station to leave for Philadelphia, the city marshal ordered them to disperse. When defiant mothers still tried to get their children aboard the train and resisted the authorities, police dragged them by the hair, beat them with clubs and arrested them as their horrified children looked on. The national reaction was swift and visceral and marked a turning point. President Taft asked his attorney general to investigate and Congress began a hearing. It was then that the country learned that a third of mill workers, whose life expectancy was already less than 40 years old, died within a decade of taking their jobs in the Everett Mill. If death didn’t come slowly through respiratory infections such as pneumonia or tuberculosis from inhaling dust and lint, it could come swiftly in workplace accidents. Fourteen year old Carmela Teoli shocked lawmakers by recounting how a mill machine had torn off her scalp and left her hospitalized for seven months. The Bread and Roses Strike was not just a victory for Lawrence workers. 275,000 New England textile workers received raises, and other industries followed suit. Not to put too fine a point on it, improvement in worker safety, living conditions and longevity can be laid at the feet of the labor movement which worked to promote a higher standard of living for the citizens of our country. In his letter this morning James reminds us that Sunday is not necessarily the most important day of the week. The most important day is not one in which all we do is listen to the Gospel, the most important day is each one in which we put into action all that we have heard—not simply for the benefit of ourselves, but for all those who struggle. Labor Day weekend affords us an opportunity to give thanks for blessings most all of us enjoy such as a 40 hour work week, weekends, living wages, safer working conditions and environmental protections. So many of these would not have been possible without the heroic efforts of men and women who labored long hours at low pay, and frequently under punishing conditions, to make life better for all of us. Perhaps James would want us to take a moment this weekend and imagine, what Jesus would say about the Bread and Roses Strike? What are the values and insights that we hear in holy scripture, and how might these encourage us to actively work to change the world in which we labor and live? In Jesus’ name. Amen.